I never really understood the draw of big discount stores like Costco until I was a mom. Granted, I never really needed anything in bulk until I was married with children, so that could explain a lot. But even after I had kids, it took me a while to discover all the amazing wonders of this magical land called Costco. If you’ve never been, or are clueless like I was, I would like to enlighten you with just a few reasons why we moms love Costco. You’re welcome. 1. Giant double seater carts. 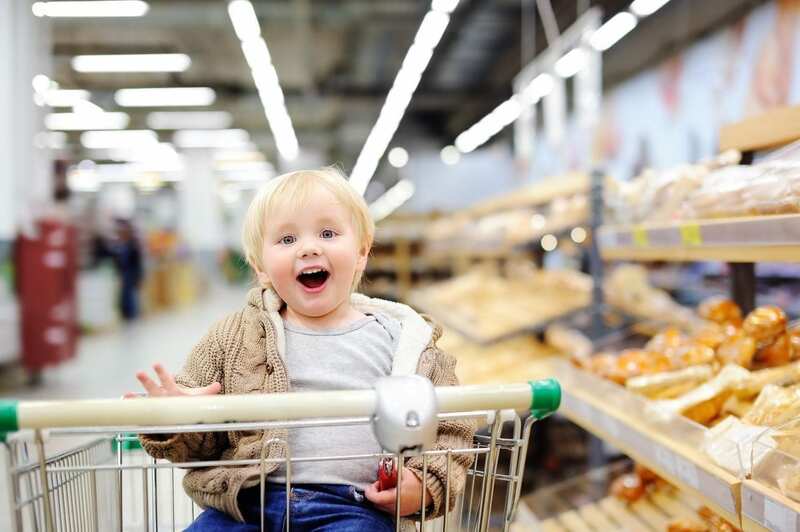 There is nothing I hate more than going grocery shopping with my kids in tow. I think I would rather do hard physical labor than drag my children through a grocery store. But sometimes it’s unavoidable, unfortunately. At a normal grocery store, my kids like to fight over who rides in the front seat of the cart and who gets to walk. Most of the time my oldest walks but she always starts whining about how tired she is halfway through the store. By that time, I’ve got a cart full of groceries in the basket, her little brother in the seat and she’s too big to fit under the cart anymore so she has no where to go. Usually, I have to threaten to leave her in the freezer section where it’s cold and uncomfortable before she’ll start moving along again (at the pace of a sloth, of course). It makes me bonkers. So when I go to Costco and we get a giant double seater cart where I can restrain both of my children at the same time, it’s like the heavens have opened and I hear angels sing. It’s magical, I tell you. Magical. 2. Free samples = lunch for kids. At the end of every other aisle of Costco, there is a nice elderly lady with a hair net and gloves passing out free samples of random delicious food or snack items. I love these ladies. I don’t even care what they’re passing out; if it’s being passed out by Grandma-type ladies, my kids will eat it. One sample will get me through 90% of an aisle before my kids start fighting or whining again and then all of a sudden there’s another sample lady and all is well again. Costco’s art of child distraction is on point, y’all, and I love them for it. Plus, if you go around lunch time, it’s free lunch for the kids! Win-win. 3. Diapers & wipes in bulk. If you’ve had a baby for more than 5 minutes, you’ll understand how many diapers a single child can go through in a week. It is an ungodly amount, you guys. When we got our Costco membership, I decided to give their bulk diapers and wipes a try because (1) I’m cheap and they’re less expensive than brand diapers; (2) I’m lazy and don’t want to buy diapers and wipes more than I absolutely have to. I was astonished to find that I actually prefer the Kirkland’s brand diaper over the other brands! They don’t leak and they didn’t irritate my kids sensitive bums. And I LOVE that I can buy one or two boxes and be set for at least a month! 4. Snack foods in bulk. My kids (and husband, let’s be honest) pretty much live off of snack food. I don’t understand why no one in this house can’t seem to live without Goldfish and Pirate’s Booty, but evidently, they can’t. I love that Costco has ginormous bags of my family’s favorite snack foods (healthy and unhealthy alike, they don’t discriminate!) so I don’t have to keep buying expensive tiny bags of the stuff every week. And I may or may not buy the giant bag of chocolate covered almonds and hide it in the pantry just for me. Don’t judge, you have a hidden mommy stash too! In all seriousness, Costco has really impressed me with their wide array of organic food options. I personally love their organic extra virgin olive oil and organic maple syrup. I also love their organic meats; we buy the chicken breast and ground beef and love it! As much as my family loves their snack foods, I do my best to provide healthy, nutritious meals and Costco has made it really easy for me to do so without breaking the bank. 6. Cheap books, clothes, and toys. Does anyone else’s kids tend to grow out of their pajamas at an alarming rate? I don’t understand it, but my kids grow out of their pajamas faster than anything else. And I’m that mom who still puts her almost-three-year-old in footie pajamas because they’re the cutest thing ever and I JUST CAN’T STOP! Anyway, I buy my kids pajamas at Costco because they’re inexpensive, a good brand (Carter’s), and they have a great variety in all sizes. Costco also has an awesome selection of kids books, games, DVD’s and toys. I find early reader books and Bob Books for my daughter who is learning to read as well as puzzles and games that are age appropriate for both kids. The books and toys they offer are great quality too (American Girl dolls around Christmas-time!). 7. Cheap Hotdogs and Pizza. So, if the snack wielding grandmas don’t fill up your hungry kids’ bellies, do not fret! Costco also has $1.50 hotdogs and $1.99 giant pizza slices! I’m not going to lie, sometimes my husband and I will make a Costco run right before lunch simply so we can buy the kids the cheap pizza and hot dogs. It makes the kids happy, it makes for an easier shopping trip, and then we can just go home and put them down for a nap! Also, we use it to bribe the children to get excited about going to Costco. We are excellent parents, obviously. 8. Wine. Aaaallll the wine. Do I really need to explain this one? I doubt it, but I’m going to anyway. Did you know that Costco is the number one wine seller in America? Surprising, I know. And you would think that because they’re a discount store, they’d sell crap wine, right? Not so. In fact, they sell really decent wine, as this article discusses. They’ve also been recognized for the Kirkland brand wine being a quality wine and worth the buy. For the wine alone, I would sign up for a Costco membership if I didn’t already have one. It is no wonder that moms love Costco so much! Not only can you feed your kids for cheap or free, buy a bazillion diapers and wipes for a fraction of the cost, get all your Christmas and birthday shopping done in one trip, fill your cart with quality organic food, and then immediately gorge on cheap but delicious pizza, you can also buy a great variety of really good wine for under $20 a bottle (usually more like $12)! What is not to love about this scenario? !